Many District customers, especially those who have just moved to the area, have questions about what makes up the cost of their bi-monthly bill. Some of the factors that affect our rates are serving customers within the Lake Whatcom Watershed, the unique topography of our district, and planning for future maintenance and improvements. Click here for more detailed information about how rates are set. Why does my bill amount change from month to month? Washington State Law requires that all water systems serving 15 or more residential service connections be metered. Your water meter measures the volume of water used in your home and from fixtures on your property. Click here for more information about metered water. If you use more water in a billing cycle than normal, your bill will increase. Thinking back to the months covered, did you have guests in your home? Did you fill a pool or hot tub, a pressure washer, or a watering hose? Did you have a leaky faucet or discover a toilet was running? Any of these things can affect your water usage over time. Many customers bills tend to be higher during the summer months. Customers may set up paperless billing through our partner, Xpress Billpay. Unfortunately, only property owners (not tenants) are able to set up paperless billing. When do rate increases occur? 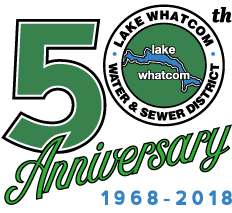 Lake Whatcom Water & Sewer District rates undergo a small rate increase each year. Depending on the area you live in, you will see the increase each year either on your March 1 or April 1 bill. Click here for more information about our rates. My water has been turned off. How do I have it turned back on? For accounts where water and sewer service charges are not paid within sixty days of the billing date, the District may interrupt water service and padlock the meter. For information on how to have your water service restored, please see below. If your bill is current and you do not have water, please call us at 360-734-9224 so we can help! A Utility Local Improvement District (ULID) is the procedure used to extend service to a group of properties whereby all property owners share in the cost. This process is a formal State defined procedure covered under the Revised Code of Washington (RCW 36.94.230). Property owners in the benefit area may pay the assessments in a single lump sum or pay in installments over a period of time not exceeding 20 years at an interest rate set by the governing body of the public entity empowered by law to form the assessment.